Make My Day Products is an Australian company who specialise in well designed, attractive and functional kitchen and household products. Their strapline is “simple, practical, designed to make your day”. 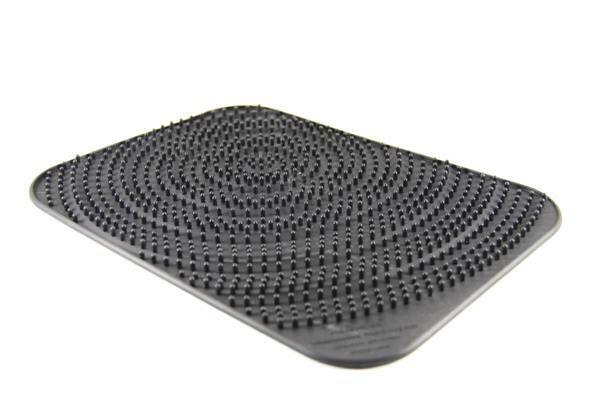 This mat is a great design. It’s simple and straightforward, big enough to hold a clutch of glasses so that they drain properly and dry without streaks. It withstands heat of up to 300c, so it’ll survive the dishwasher, and it does a far better job than than the dirty tea towel I normally use. It works. It looks good. It rolls up really small for storage. It comes in several colours. It’s a really clever solution to a tricky problem. £14.99, from Ma Cuisine, 01380 722322, online stockists coming soon. I am trying to find out the dimensions of the glass drying mat.